in+ dos not work in 2019 is it me or is there a trick??? Hello Friends, I recently got a new job. My old workplace had MC X6 and my new workplace has 2019. I am having trouble increasing the accuracy of the visualization in the "Verify" window. In X6, I could just go to the options and specify the tolerance I wanted. I have not been able to find a way to do that in 2019. I have noticed in 2019 that there is a "Performance-------Precision" slider which I have all the way to precision. I am trying to verify a part's surface finish toolpaths and realized that the window I was looking at was very pixelated. I have attached a picture of the simulation of a simple arc cut that turned out very pixelated. How do I increase the precision beyond what the slider can give me? Is 2019's verify less precise than X6? Many thanks! This is an eBook. An internet connection is required to access it. Published by In-House Solutions Inc. ISBN: 978-1-77146-819-0 The Mastercam 2019 Handbook Volume 1 is an excellent resource that teaches the theory of Mastercam Mill and Solids. The material intertwines conceptual subject matter with practical applications suitable for beginners and intermediates alike. You not only learn how to use Mastercam, but why things work as they do. This book teaches basic/advanced principles of 2D CAD modeling and machining. This is an eBook. An internet connection is required to access it. 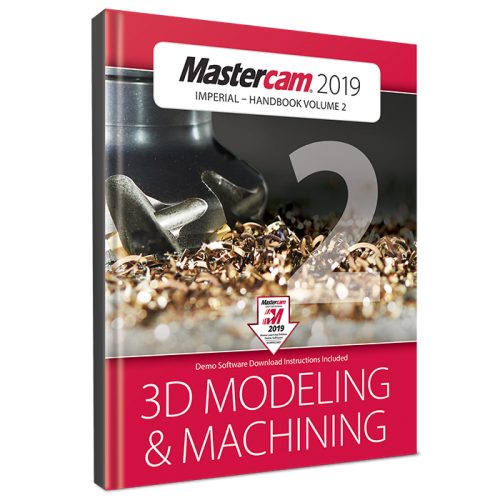 Published by: In-House Solutions Inc. ISBN: 978-1-77146-820-6 The Mastercam 2019 Handbook Volume 2 provides an academic approach to teaching Mastercam 3D modeling and machining. The material intertwines conceptual subject matter with practical applications most suitable for intermediates or individuals that have completed Volume 1. This book teaches advanced 3D CAD modeling and machining. This is an eBook. An internet connection is required to access it. 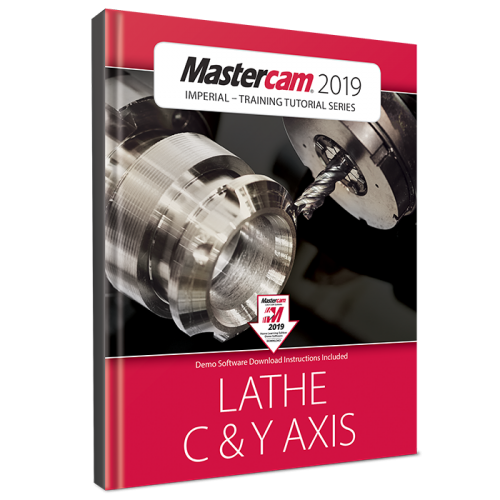 Published by: In-House Solutions Inc. ISBN: 978-1-77146-821-3 The Mastercam 2019 Handbook Volume 3 provides an academic approach to teaching Mastercam Multiaxis. The material intertwines conceptual subject matter with practical applications most suitable for intermediates or individuals that have completed Volume 1 and Volume 2. This book teaches Multiaxis and advanced toolpaths. This is an eBook. It requires an internet connection to access. 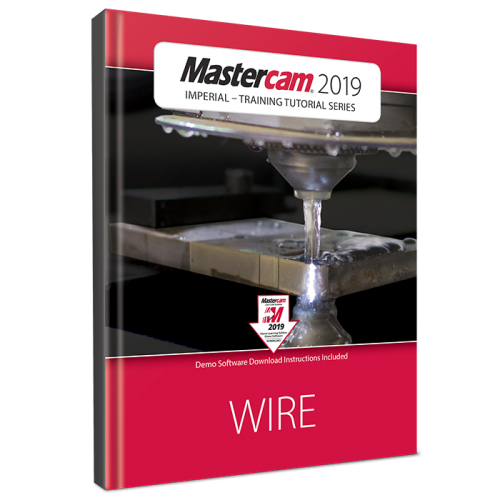 Published by In-House Solutions Inc. IBSN: 978-1-77146-801-5 The Mastercam 2019 Wire Training Tutorial provides users with an excellent resource for learning how to use Mastercam to program Wire EDM machines. The tutorials focus on 2D & 3D Geometry creation and Wirepath creation such as Contour, 4-Axis and No Core. Open contours, Multiple contours, dies and Taper angle projects are covered in detail. Each tutorial guides users from geometry creation through to G-Code generation. Additionally, each tutorial includes description of the parameters used in the different dialog boxes such as the Wire/Power, Cut Parameters, Compensation, Stops, Leads and Taper. This is an eBook. An internet connection is required to access it. 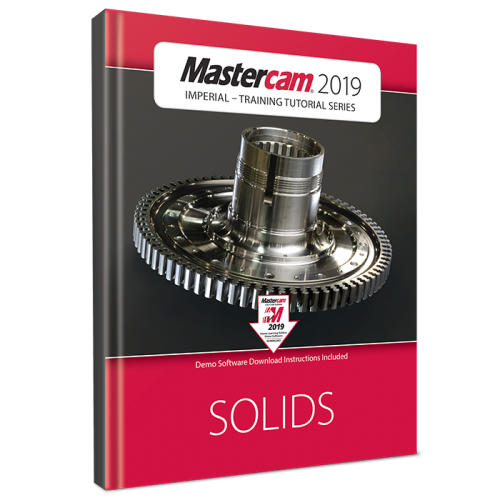 Published by In-House Solutions Inc. ISBN: 978-1-77146-797-1 The Mastercam 2019 Solids Training Tutorial contains several tutorials that provide concise step-by-step instructions on creating 3D wireframe and solid geometry. Illustrating a variety of useful Solids commands, users can expect detailed coverage to include Extrude, Loft, Revolve, Sweep, Boolean Add and Remove, Fillet, Chamfer, Shell, Trimming, Creating Solid patterns, Changing a Solids colors and creating solid geometry from surfaces. You will also learn how to manipulate a solid by using commands from the Model Prep menu such as Push-Pull, Move and Split Solid Face. This is an eBook. It requires an internet connection to access. 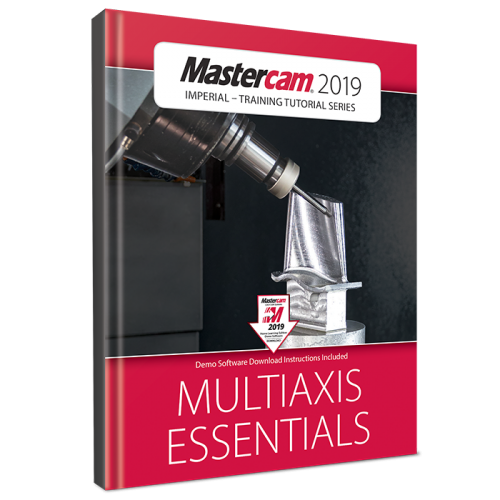 Published by In-House Solutions Inc. ISBN: 978-1-77146-802-2 The Mastercam 2019 Multiaxis Essentials Training Tutorial is intended for the advanced Mastercam user looking to learn Mastercam Multiaxis programming. A firm grasp on both 2D and 3D machining is required and can be attained by completing the Mill Essentials and Mill Advanced Training Tutorials. The Intro to Multiaxis Training Tutorial covers the different applications that are available by configuring the Rotary Axis Control page including: Rotary axis positioning and Axis substitution. The book also covers the Multiaxis Classic family toolpaths: Rotary, Curve, Swarf, Flow, and Msurf. A special tutorial is dedicated to teaching how to drill and circle mill holes using Multiaxis toolpaths. Specific parameters such as Cut patterns, Tool Axis Control, Limits, Collision Control, Linking and more are described in detail. The contents also describe how to verify the toolpaths using the new Machine Simulation module that combines toolpath backplot mode and material removal mode with collision detections. This is an eBook. An internet connection is required to access it. 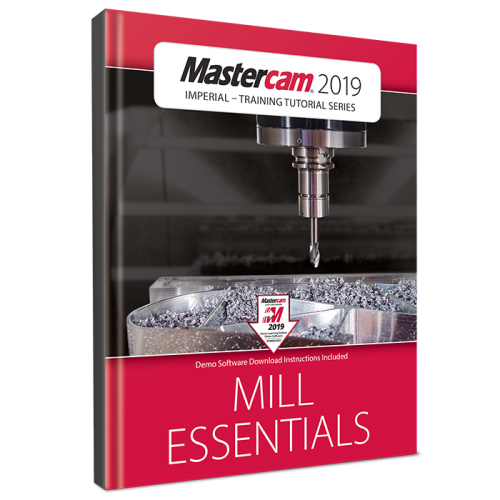 Published by: In-House Solutions Inc. ISBN: 978-1-77146-794-0 The Mastercam 2019 Mill Essentials Training Tutorial features concept-filled tutorials, challenging practice exercises and short quizzes following every tutorial providing a comprehensive look at geometry creation and 2D toolpathing for Mastercam Mill. This book begins with the absolute basics by introducing the Mastercam user interface and it will have you creating geometry, drilling and creating contour toolpaths before you know it. Its gradual progression lends way to more advanced concepts such as multiple setup scenarios and 2D High Speed Toolpaths. All of the parts within the book are designed with machinability in mind. A multitude of topics are covered including 2D geometry, solid geometry, tool settings, stock setup, drilling, tapping, contouring, pocketing, circle milling and slot milling. You will learn the 2D High Speed Toolpaths such as Dynamic Mill, Area Mill, Dynamic Contour, Peel Mill & Blend Mill, how to import a solid and machine it and using the WCS in multiple fixture applications. This is en eBook. An internet connection is required to read it. 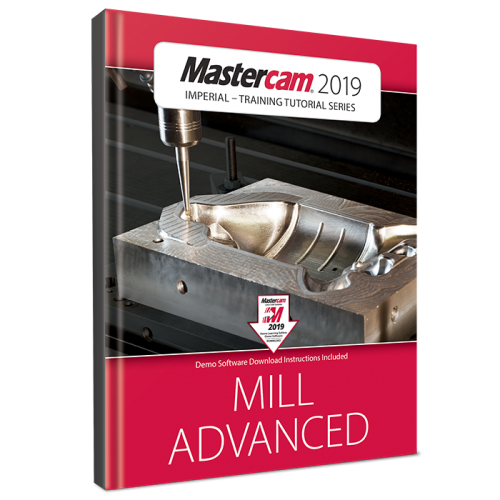 Published by: In-House Solutions Inc. ISBN: 978-1-77146-795-7 The Mastercam 2019 Mill Advanced Training Tutorial contains projects and accompanying practice exercises that span a wide degree of complexity. It is strongly recommended to have a good understanding of 2D machining (provided in the Mill Essentials Training Tutorial, for example) before beginning this book. All of the parts are designed with machinability in mind and include suggested fixtures and tool setups. Clearly laid out objectives and dimensioned step previews make it easier than ever to follow along. The content covers 3D wireframe, surface geometry creation and solid creation, Surface Finish and Roughing toolpaths. An emphasis is put on the advanced Surface High Speed toolpaths, STL Stock creation and its use in solid model verification. Also covered is how to create and manage Stock models in the Toolpath Manager. This is an eBook. An internet connection is required to access it. 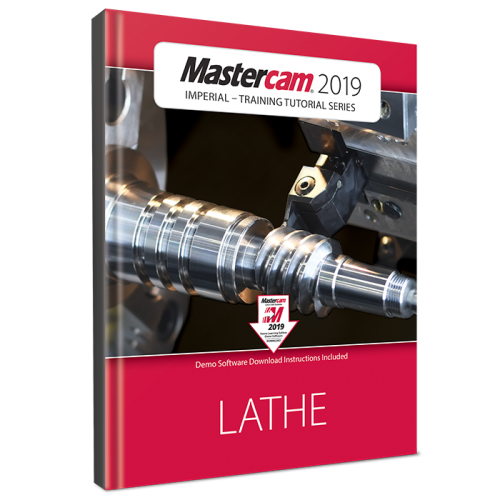 Published by: In-House Solutions Inc. ISBN: 978-1-77146-796-4 The Mastercam 2019 Lathe Training Tutorial consists of part-oriented tutorials, and practice exercises that provide users with an excellent foundation in Lathe. The material emphasizes the machinability of parts with suggested fixtures, setup sheets & more. The Lathe Training Tutorial is ideal for beginners and current Mastercam users alike. Step-by-step tutorials introduce 2D geometry creation along with detailed coverage of 2D toolpaths such as Face, Rough, Finish, Drilling, Grooving, Grooving on an angle, Inside Boring, Cutoff, Threading and Canned Cycles for Rough and Finish. Details on Stock Transfer, Stock Flip, Stock Advance and tailstock toolpaths, in addition to instruction on importing a SolidWorks file and using the Turn Profile command to create Geometry and a VTL tutorial are also found within. This is an eBook. An internet connection is required to access it. Published by: In-House Solutions Inc. ISBN: 978-1-77146-813-8 The tutorial consists of part-oriented tutorials intended for the advanced lathe user that wants to learn how to program lathe parts that include milling operations. You must have the Mastercam Lathe and Mill Software in order to use this tutorial. You will learn how to create the more complex 3D geometry and Advanced C-Axis toolpaths. The tutorial also covers toolpaths that support the Y-axis rotation and examples on how to use the Mill toolpaths on a Lathe with Live Tooling. It's not available for downloading from official website, one of my friends told me there is a horrible bug in 2019 so they disabled downloading. But he refused to tell me any detail. Does anybody have any clue about this bug? My friend told me it's nothing wrong with programming and posting in 2019, only about the software itself. So I'm still gonna use it for programming, since I don't know any other software. ----------------------------------------------------------------------------- No big issue, just migration problem, no worries. Here's the official explanation: Hi Everyone, We have run into a critical issue related to file migration with Mastercam 2019. As a result, we have pulled the release from the downloads section of Mastercam.com. This issue does not affect all files and is limited to certain file types. Customers already running Mastercam 2019 who have not received this error do not need to uninstall and they can continue using the software. We are in the process of building and testing a fix. Once that fix has been approved and ready to be released, we will post new version of Mastercam 2019 to the Mastercam downloads page. More details will be posted in this thread at a future time. Thank you for your patience as we resolve this issue.